These small wooden dowels are the replacement dowels for your birds Tiki Takeout foraging toy. 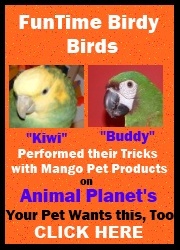 Don't let your birds fun stop when he or she has gone through his or her initial set of small dowels. Tiki Takeout Small Dowel Refill5SharonFebruary 10, 2013This is a great toy! It took my umbrella cockatoo, Snow a short while to show interest -- 1-2 days and now he goes for it every time I fill it with new dowels! A great toy.